English writer John Ruskin once said that “The purest and most thoughtful minds are those which love color the most,” and colored wedding cakes versus their traditional white or ivory counterparts are much debated during design consultations at Jody’s Pantry Catering. As would be expected, many brides operate within the first school of thought that to be truly traditional and elegant, a wedding cake must be a base of white or ivory with tone on tone decor. 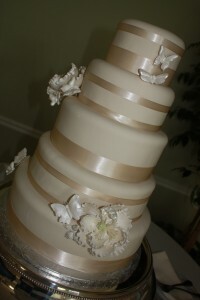 For tone on tone wedding cakes we like to recommend a pearl coat applied to the base coat to add some sheen or lustre to the cake which adds a little drama and dimension. This is a lovely way to create an understated wedding cake that will stand the test of time and remain elegant over the years as you peruse your wedding album. 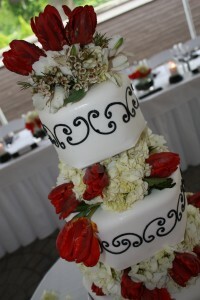 The second group of brides contains an overwhelming majority that feel some color garnish is warranted, but the base color of the wedding cake must still be white or ivory. 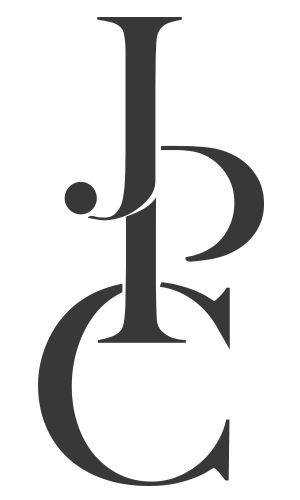 This is achieved best through ribbon garnish, fresh or handmade gumpaste flowers, or piped accents of scrolling, monogram or other colored decor. The third and final cluster of brides embraces color thus opening a full spectrum of possibilities for their wedding cake. Limitless today thanks to the popularity of fondant applications, custom colors can be matched to your wedding pallette to create a flow throughout your event design elements to your cake. 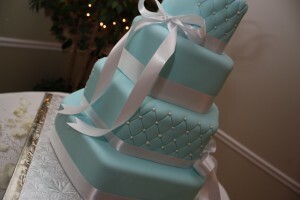 I recently created a beautiful and elegant tiffany blue hexagonal cake for a wedding held in July 2009. 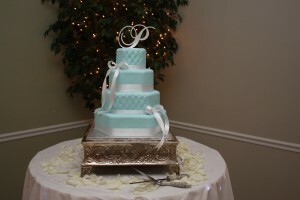 The pastel color pallette of the cake accented with edible pearls, shimmering satin ribbon and a mother of pearl embellished monogram topper was both a stunning compliment to the table linens and tiffany blue favor boxes, as well as a conversation piece among the guests throughout the evening. Essentially there is no right or wrong position on this wedding cake color issue, but rather personal choice and taste must dictate your decision. Don’t be afraid to consider color as you weigh your options, however, as it can be utilized in your cake design with a result that is every bit as elegant, trendy or timeless as the more traditional selections. All cake photography credited to Jody’s Pantry Catering. 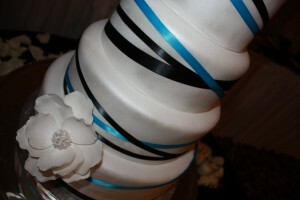 All cake designs are copyrighted by Jody’s Pantry Catering.